The Mexican Libertad is one of the most famous and demanded series in the precious metals industry. This magnificent 2016 1/20 oz Mexican Silver Libertad Coin is a popular choice not only because of its attractive and internationally known design but also because it comes in Proof Condition. This Proof Libertad was produced with a special polished and treated die, providing the highly detailed and frosted look of the design, with a mirror-like finish on the background. The Casa de Moneda de México, one of the oldest refineries in North America, has been manufacturing the Libertad coins in a range of sizes including 1 oz, 2 oz, 5 oz, 1/10 oz, 1/20 oz, 1/40 oz, ½ oz from .999 fine silver. This wide bunch of sizes allows the Silver Libertad to be highly desirable Silver coins on the market. The Libertad coins have a lower mintage than American Eagles or Canadian Maple Leaf, which also makes them highly collectible. 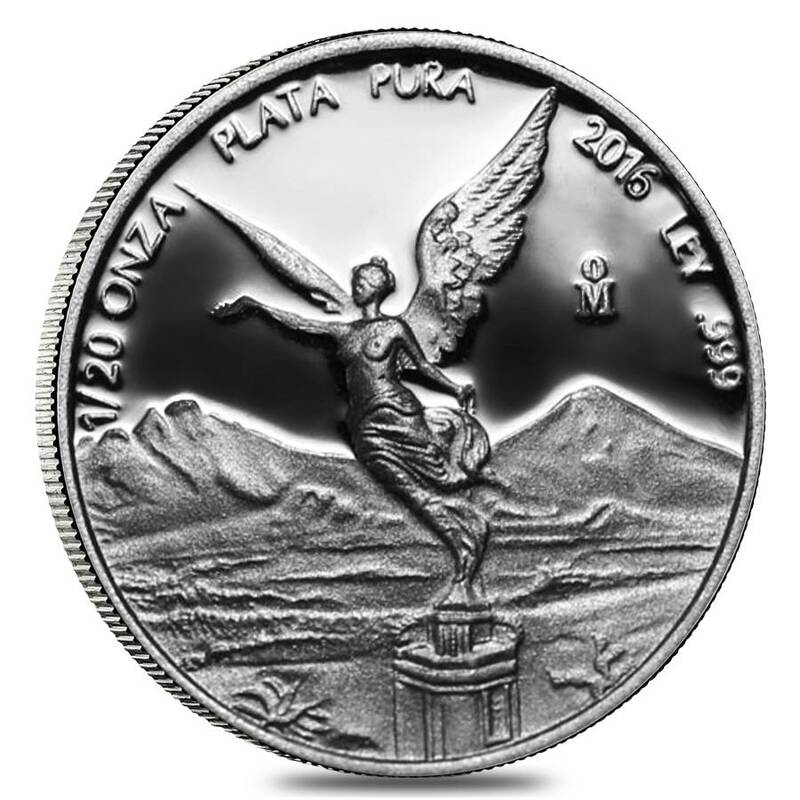 The coin's reverse honors a winged Victoria of Mexican Independence situated in front of a landscape of volcanoes. The Winged Victory goddess, original from the Roman culture, is considered a significant and historic symbol in Mexico. The volcanoes named Popocatepetl and Iztaccihuatl dedicated to a legend about a love story of a warrior named Popocatépetl and Iztaccíhuatl, a king’s daughter. The coin's obverse design depicts the Mexican National seal with an eagle sitting atop a cactus.The magnificent eagle is surrounded by symbols representing Mexico’s 10 provinces. This beautiful Proof Silver coin is a popular choice among long-term investors and passionate collectors and will be a great addition to any collection. Coin contains .999 fine Silver, weight of 1/20 troy oz. 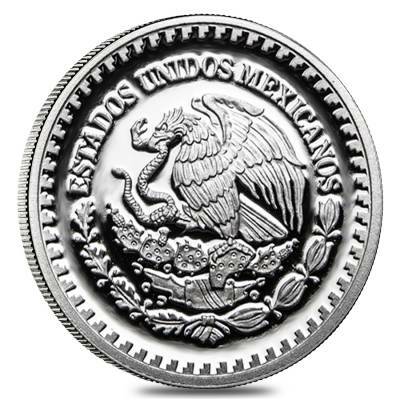 Produced and guaranteed by the La Casa de Moneda de México, commonly known as the Mexico City Mint. Comes in original mint capsule. Obverse: Depicts the National Seal of Mexico. Inscribed: The official name for Mexico in Spanish - “Estados Unidos Mexicanos”. Reverse: Showcases two symbols of the Mexican culture: the Winged Victory statue in the forefront and the Mexican volcanoes Popocatépetl and Iztaccíhuatl in the background. At Bullion Exchanges, you will find only high-quality bullion coins at very affordable prices. 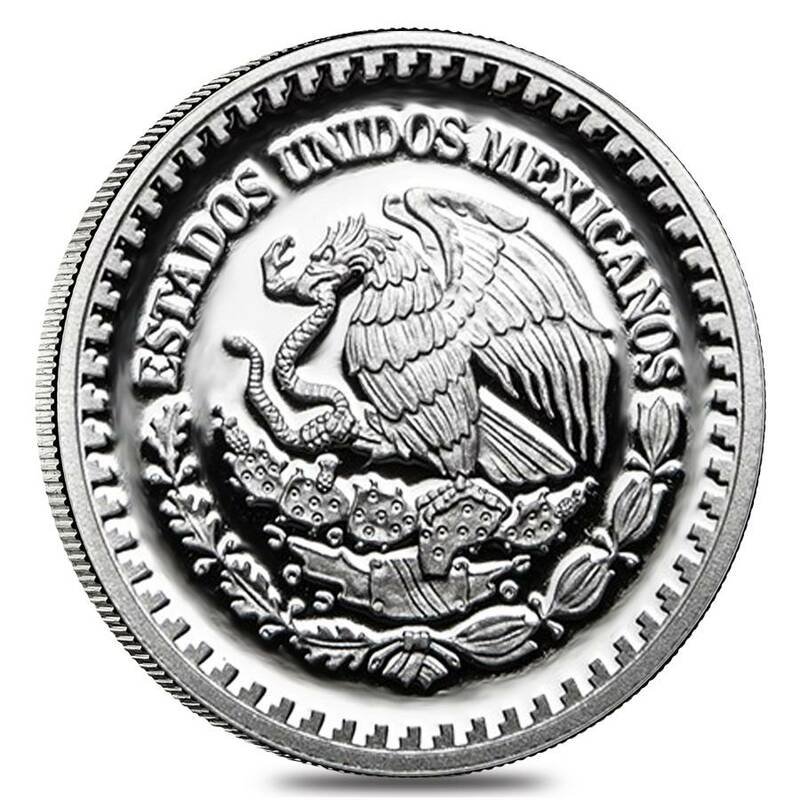 Order this 2016 1/20 oz Mexican Silver Libertad Coin Proof today simply by clicking on ‘Add to cart’. Your spectacular coin will be delicately wrapped, packaged and shipped to your address. If you have any questions, just contact us by phone at 800.852.6884 or write us a message, we will be happy to assist you. stunning coin at a super price. definitely a must for any collector, even the youngest one! For every $1 spend, you will earn 1 Bullionaire Buck which is equivalent to $0.001 off a future purchase. 10 BB = $0.01.